This fabulous project was from one of team members in our current challenge and we wanted for you to be able to create it yourself so we have the tutorial for you. I'm back today with a reminder that we are halfway through the month of June. You still have time to join in the challenge on the Scor-Pal blog - just use some ribbon, lace, or trim, and 'More than one fold'! 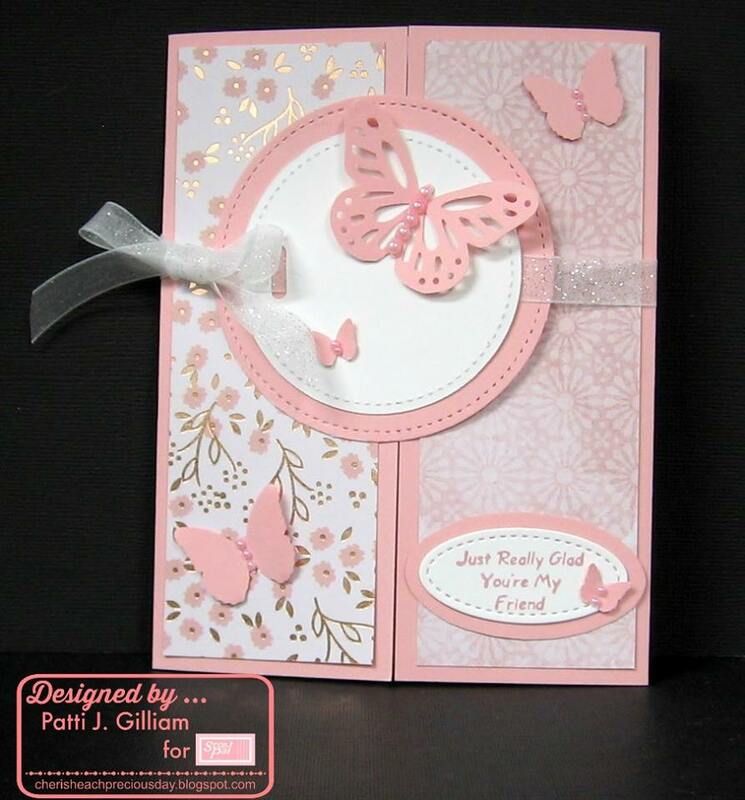 I'm back here today to show you how easy a gatefold card can be when you use your Scor-Pal! You will start with an 8 1/2" x 5 1/2" piece of cardstock. Place the long side at the top of your Scor-Pal, and score at 2 1/8" and 6 3/8". Scor-Buddy, and the new Scor-Pal with 1/8" grooves. Burnish score lines with Scoring Tool. Cut a piece of white cardstock 4" x 5 1/4", and adhere to the inside center panel of your card, using Scor-Tape. Set aside. Die cut or punch 2 sizes of your shape choice in coordinating colors. For this card, I used circles. Die cut or punch 2 sizes of your shape choice in coordinating colors for sentiment. For this card, I used ovals. Apply Scor-Tape to two 1 7/8" x 5 1/4" panels of patterned paper, and adhere to card front. Add a little Scor-Tape to the larger circle to hold your ribbon in place. Punch a hole, or slot in white panel for ribbon to slide through, and add Scor-Tape to the smaller circle. Slip the ribbon through the slot, and adhere small circle to large circle. Add Scor-Tape to just the left half or the large circle. Adhere large circle to left side of card front. Stamp sentiment on small oval, adhere to large oval, and adhere to card front. This card used more of the beautiful 12 x 12 cardstock and papers that DCWV had generously sent to Scor-Pal Owner, Diana Crick for us to design with. Isn't it pretty? We'd love to see your project linked up on our challenge this month! are something I reach for with nearly every project. I'm so excited to have the new Scor-Pal Eighths board with the scoring grooves at every eighth inch. It makes everything so easy! Wow, Patti, this is absolutely stunning!! I love the layers and design!! Thank you for the pretty "anytime card". Butterflies are my life theme and I love finding different ways to close these cards and hide the method. The layered oval and ribbon is perfect. Click here to see all upcoming Scor-pal events and promotions.